Never thought I'd see the day but ....the potato is dying out in Ireland as pasta takes over according to The New York Times. My father and his generation are surely turning in their grave. My Dad was a spud specialist, a man who could tell with one bite what part of Ireland a potato came form and what kind it was. It was the Irish equivalent of a French wine connoisseur, and he was noted for it. He was not alone, for most of the last century before new-fangled food like pasta came in the spud was the common denominator a in every Irish household rich or poor. Now it seems the spud is on its way out --along with the pub, the Catholic religion etc. Irish families in the modern world are preparing pasta which takes about ten minutes rather than potatoes which take far longer the newspaper reports. The paper quotes Bord Bia the Irish food marketing board as stating that potato consumption has dropped 25 per cent in Ireland. 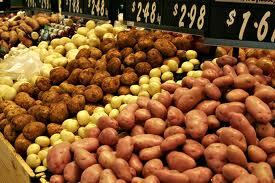 Irish mostly believe potatoes are fattening which is also a myth but the Atkins diet has remained very popular and that forbids potatoes. Vicky Leahy, a lecturer and single mother said spuds simply didn’t cut it any. Liam Glennon, president of the Irish Potato Federation, said potatoes have a poor image.